Do I have dog mites or does my dog have human mites? Pure permethrin or permethrin plus something? Why choose 10% or 36.8% permethrin? What’s the difference? Essentially mange is what you call it when a dog has scabies. But the mites on dogs are a separate, different species than the scabies mites that can live on people. If dog mites wander onto you they can cause bumps, itching and drive you crazy. So you can treat your dog and yourself, too! Here is a medical report of a woman with dog mites (called sarcoptic mange) from a puppy she got. Dog mites cannot reproduce on humans so they will die in a few days. Likewise if some of your human mites wander onto your dog they will die in a few days. But your dog can continually supply new mites! So if some of your dog’s mites are on you, if you cure your dog you will be magically cured in a few days, too. But meanwhile they can drive both of you crazy. There are many treatments for mange (dog scabies) available over-the-counter. I will describe three which should do. They are a permethrin dip (or spray), sulfur lotion, and ivermectin (oral). You can do one or all of these treatments. Important! Ivermectin can kill certain breeds of dogs, so PLEASE click here and read the list of vulnerable dog breeds! DO NOT use these treatments on cats! The dip contains permethrin and can kill cats when wet. Once dry it will not harm them, so you can use it on your dog and once the dog is dry, it will not hurt your cat. Long ago I witnessed someone use a dog flea shampoo on kittens and they all died horribly. So don't use anything with permethrin (such as the dip) on cats, kittens or puppies under 12 weeks old. I don't know anything about using a sulfur lotion on cats, so I wouldn't do that unless a vet says to. If both you and your dog are itching and have bumps and such, many references will say your dog has mange and dog mites have wandered onto you. But this medical paper describes a woman and her puppy who both had scabies mites. Wikipedia's page on scarcoptes scabiei (the mite that causes human scabies) says, "Humans are not the only mammals that can become infected. Other mammals, such as wild and domesticated dogs and cats (in which it is one cause of mange) as well as ungulates, wild boars, bovids, wombats, koalas, and great apes are affected." The truth is you don't need to know the answer. It is almost impossible to find a mite on a human…because the mites are too small to be seen by the human eye. 1. You can treat just you or just your dog and see if that does the trick. 2. Or you can treat both your dog and you at the same time. Use the products below on your dog and make up 10% sulfur lotion to use on yourself (directions for treating yourself with sulfur lotion here). Some people use 5% permethrin cream instead of the 10% sulfur lotion. You can also mix up a 1/2% permethrin solution to spray around on your dogs bed, or wherever he/she hangs out. "Sarcoptic mange tends to cause intense itching. It can result in restlessness and frantic scratching, symptoms that generally appear one week after exposure. It also can result in hair loss, reddened skin, body sores and scabs. The most commonly affected areas are a dog's ears, elbows, face and legs, but it can rapidly spread to the entire body. When passed to humans, sarcoptic mange causes a rash of red bumps, similar to mosquito bites." There is another form of mange called "demodectic mange" which has a different treatment. This page is about treating sarcoptic mange. "Demodectic mange tends to cause hair loss, bald spots, scabbing and sores. Secondary bacterial infections can make demodectic mange an itchy and uncomfortable disease." "Humans cannot get demodectic mange from dogs." First off, I have used the Nu-Stock sulfur ointment (diluted to 10%) on myself so I know is good stuff and it worked for me. I have read the ingredient lists for the Happy Jack products (lotion and dip/spray ingredient info) and they seem good to me, too. Also, they are reasonably priced. Happy Jack Kennel Dip II contains 17% permethrin AND 4.25% piperonyl butoxide (PBO). PBO seems to be safe for dogs but not for humans. Martin’s 10% Permethrin contains only permethrin and inert ingredients (no PBO or petroleum distillates). ﻿Happy ﻿Jack ﻿Sarcoptic ﻿Mange ﻿medicine ﻿is ﻿pre-mixed ﻿28% ﻿sulfur ﻿lotion/medicine ﻿which ﻿is ﻿correct ﻿for ﻿dogs ﻿(but ﻿too ﻿strong ﻿for ﻿human ﻿skin). ﻿The ﻿other ﻿72% ﻿is ﻿linseed ﻿oil, ﻿turpentine, ﻿pine ﻿tar ﻿oil, ﻿cod ﻿liver ﻿oil, ﻿lanolin, ﻿and ﻿tar ﻿acid ﻿oil. ﻿Sulfur ﻿will ﻿ease ﻿itching, ﻿kill ﻿bacteria ﻿and ﻿is ﻿easy ﻿to ﻿apply. ﻿Directions: ﻿Shake ﻿well. ﻿Apply ﻿once ﻿a ﻿day ﻿for ﻿several ﻿days ﻿(leave ﻿it ﻿on). ﻿Wear ﻿rubber ﻿gloves ﻿and ﻿work ﻿well ﻿into ﻿the ﻿skin ﻿with ﻿a ﻿slow, ﻿firm ﻿finger ﻿massage. ﻿On ﻿areas ﻿that ﻿respond ﻿slowly, ﻿use ﻿twice ﻿a ﻿day ﻿until ﻿healed. ﻿After ﻿applying, ﻿keep ﻿your ﻿pooch ﻿outside ﻿or ﻿in ﻿the ﻿garage ﻿for ﻿at ﻿least ﻿20 ﻿to ﻿30 ﻿minutes ﻿to ﻿let ﻿it ﻿dry. ﻿More ﻿info ﻿at ﻿WebMD ﻿for ﻿Pets. ﻿Happy ﻿Jack ﻿Sarcoptic ﻿Mange ﻿medicine ﻿is ﻿28% ﻿sulfur. ﻿Nu-Stock ﻿ointment ﻿is ﻿73% ﻿sulfur, ﻿so ﻿you ﻿need ﻿to ﻿dilute ﻿1 ﻿part ﻿Nu-Stock ﻿to ﻿2 ﻿parts ﻿hair ﻿conditioner ﻿for ﻿dogs. ﻿to ﻿make ﻿a ﻿24% ﻿solution. ﻿Note: ﻿humans ﻿use ﻿a ﻿10% ﻿sulfur ﻿lotion, ﻿not ﻿24 ﻿or ﻿28%! ﻿— ﻿more ﻿info ﻿on ﻿the ﻿recipe ﻿for ﻿sulfur ﻿lotion ﻿for ﻿humans ﻿here. ﻿Remember ﻿it ﻿is ﻿toxic ﻿to ﻿cats ﻿when ﻿wet, ﻿so ﻿keep ﻿cats ﻿away ﻿until ﻿it ﻿is ﻿dry. ﻿Once ﻿dry ﻿it ﻿is ﻿safe ﻿for ﻿cats ﻿to ﻿touch ﻿the ﻿treated ﻿surfaces. ﻿You ﻿use ﻿a ﻿sponge ﻿or ﻿a ﻿cup ﻿or ﻿a ﻿sprayer ﻿to ﻿apply ﻿the ﻿solution. ﻿Obviously ﻿outdoors ﻿is ﻿a ﻿better ﻿place ﻿to ﻿do ﻿this! ﻿Get ﻿him ﻿soaked ﻿all ﻿over ﻿EXCEPT ﻿NOT ﻿his ﻿eyes ﻿or ﻿mouth. ﻿In ﻿other ﻿words, ﻿don't ﻿put ﻿it ﻿on ﻿his ﻿face. ﻿Then ﻿you ﻿simply ﻿let ﻿your ﻿dog ﻿drip ﻿dry. ﻿Don't ﻿towel ﻿him ﻿off. ﻿Repeat ﻿this ﻿treatment ﻿as ﻿described ﻿on ﻿the ﻿bottle. ﻿It ﻿can ﻿take ﻿a ﻿month ﻿of ﻿repeated ﻿treatments ﻿to ﻿cure ﻿mange. The interesting thing about oral ivermectin is that it is prescribed on a dose per kg basis. That means one can calculate out their ideal dose themselves. Here is a page with dosages for dogs. Here is a page about cautions for dogs and cats. Here is a page with dosages for humans. So first you need to know your dog's weight. You can call your vet to check their records or pick him up and stand on your scale. Then put him down and weight yourself alone. The difference is the weight of your dog. See this page for how to measure ivermectin (there's a video, too). 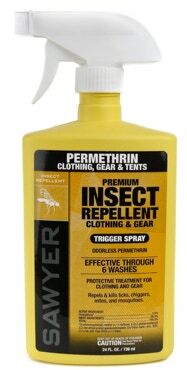 Why choose 10% or 36.8% permethrin? Short explanation: use 10% permethrin for uses that touch skin and 36.8% for a spray to treat anything not alive (like furniture or the yard). Look at the sample labels below. The kind with no petroleum distillates says "CAUTION" on the label in big letters. The kind that contains petroleum distillates says "WARNING" on the label in big type (and it says "Contains petroleum distillates" in small type). You can even use the 36.8% to tickproof clothing, just not while you are wearing them. Dilute it to 1/2% and apply by soaking or spraying and then let your clothes drip-dry in the garage or outside (but in the shade because sunlight degrades permethrin) until they are completely dry before wearing them. That usually means overnight. 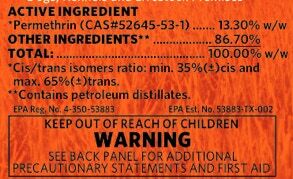 Obviously 36.8% permethrin is more economical, but it does contains petroleum products (something like mineral spirits) so you don't want to apply this stuff directly to your skin or your pet's skin. If you are spraying it around on pet bedding or furniture or the yard, then the solvents evaporate and everyone is happy. But solvents are very irritating to one's skin — it won't kill you but be aware and wash your hands and/or wear gloves and follow the directions on the bottle. Here is an MSDS for Permethrin SFR (notice it lists "hydrocarbon solvent 26%" and on the label it will says "Contains petroleum distillates"). It also lists “Triacetin” which is a food additive. The “Surfactant blend” is a proprietary secret. Using 10% permethrin concentrate will cost 3 times as much per gallon of solution, but it contains no petroleum distillates. It is easier on skin so use this to make a solution for treating a pet's skin (such as for a dip). ~ (it's called the MSDS or the Manufacturer's Safety Data Sheet). Notice it does not list any kind of solvents or petroleum distillates for the 10% permethrin. 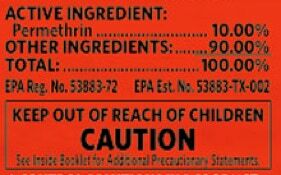 When you get the permethrin concentrate, look at the label…if it contains petroleum distillates it should say so. The lower one does not say that and also says “Caution”. That means it does NOT contain petroleum products. Read what “Notice”, “Caution”, “Warning”, and “Danger” mean here. A 12-oz tube will make 36 oz of 24% sulfur lotion! ﻿When ﻿I ﻿had ﻿scabies ﻿I ﻿made ﻿my ﻿own ﻿5% ﻿lotion ﻿because ﻿the ﻿prescription ﻿cream ﻿was ﻿ridiculously ﻿expensive ﻿and ﻿because ﻿doctors ﻿either ﻿wouldn't ﻿believe ﻿I ﻿had ﻿scabies ﻿or ﻿wouldn't ﻿prescribe ﻿enough ﻿to ﻿cure ﻿me. ﻿Prescription ﻿cream ﻿was ﻿$80 ﻿for ﻿2 ﻿ounces ﻿and ﻿my ﻿homemade ﻿lotion ﻿cost ﻿under ﻿$2 ﻿make ﻿that ﻿much. ﻿In ﻿many ﻿countries ﻿5% ﻿permethrin ﻿cream ﻿is ﻿$5 ﻿and ﻿is ﻿over-counter. ﻿Why ﻿it ﻿is ﻿so ﻿expensive ﻿here? ﻿Partly ﻿because ﻿there ﻿are ﻿different ﻿grades ﻿of ﻿permethrin ﻿and ﻿the ﻿most ﻿pure ﻿is ﻿in ﻿the ﻿prescription ﻿cream, ﻿but ﻿I ﻿suspect ﻿mostly ﻿there ﻿is ﻿a ﻿lot ﻿of ﻿profit ﻿to ﻿be ﻿made. ﻿I ﻿simply ﻿mixed ﻿half ﻿Martin’s ﻿10% ﻿Permethrin ﻿with ﻿half ﻿skin ﻿lotion ﻿to ﻿result ﻿in ﻿a ﻿5% ﻿permethrin ﻿lotion. ﻿I ﻿tried ﻿various ﻿skin ﻿lotions ﻿and ﻿wound ﻿up ﻿using ﻿Gold ﻿Bond ﻿Ultimate ﻿skin ﻿lotion ﻿because ﻿it ﻿is ﻿very ﻿thick ﻿so ﻿the ﻿resulting ﻿mixture ﻿wasn't ﻿so ﻿runny. ﻿You ﻿can ﻿find ﻿Gold ﻿Bond ﻿Lotion ﻿on-line ﻿or ﻿in ﻿Walmart ﻿or ﻿Target ﻿(it's ﻿all ﻿over!). ﻿Example: ﻿I ﻿mixed ﻿1/4 ﻿cup ﻿10% ﻿permethrin ﻿with ﻿1/4 ﻿cup ﻿skin ﻿lotion ﻿to ﻿make ﻿1/2 ﻿cup ﻿of ﻿5% ﻿permethrin ﻿lotion. ﻿Yes, ﻿it ﻿was ﻿that ﻿simple. ﻿I ﻿cannot ﻿recommend ﻿anyone ﻿else ﻿mixing ﻿up ﻿their ﻿own ﻿lotion ﻿because ﻿the ﻿manufacturer ﻿threatened ﻿to ﻿sue ﻿me ﻿when ﻿I ﻿made ﻿a ﻿video ﻿showing ﻿how ﻿I ﻿made ﻿my ﻿own. ﻿My ﻿homemade ﻿5% ﻿lotion ﻿worked ﻿fine ﻿for ﻿me, ﻿but ﻿making ﻿your ﻿own ﻿lotion ﻿is ﻿an ﻿off-label ﻿use, ﻿so ﻿you ﻿have ﻿to ﻿decide ﻿for ﻿yourself ﻿what ﻿to ﻿do. ﻿I'm ﻿just ﻿telling ﻿you ﻿my ﻿experience. ﻿I ﻿am ﻿not ﻿a ﻿doctor ﻿and ﻿I ﻿am ﻿not ﻿telling ﻿anyone ﻿else ﻿what ﻿to ﻿do ﻿or ﻿not ﻿do. ﻿Obviously ﻿with ﻿anything ﻿new ﻿I ﻿always ﻿tried ﻿it ﻿on ﻿a ﻿small ﻿area ﻿of ﻿my ﻿skin ﻿and ﻿then ﻿waited ﻿20-30 ﻿minutes ﻿to ﻿see ﻿if ﻿I ﻿had ﻿any ﻿bad ﻿reactions. ﻿I ﻿usually ﻿try ﻿new ﻿treatments ﻿on ﻿my ﻿forearm ﻿because ﻿the ﻿skin ﻿isn't ﻿so ﻿sensitive ﻿there. ﻿When ﻿I ﻿used ﻿the ﻿10% ﻿that ﻿did ﻿not ﻿contain ﻿petroleum ﻿distillates ﻿I ﻿had ﻿no ﻿bad ﻿reactions. ﻿The ﻿kind ﻿that ﻿said ﻿"Contains ﻿petroleum ﻿distillates" ﻿made ﻿my ﻿skin ﻿very ﻿irritated. ﻿You ﻿can ﻿buy ﻿pre-mixed ﻿Sawyer’s ﻿Permethrin ﻿Spray ﻿and ﻿use ﻿it ﻿to ﻿treat ﻿where ﻿your ﻿dog ﻿hangs ﻿out, ﻿such ﻿as ﻿a ﻿cushion ﻿or ﻿where ﻿he ﻿lays. ﻿You ﻿can ﻿also ﻿spray ﻿your ﻿clothes ﻿or ﻿car ﻿seat ﻿to ﻿make ﻿it ﻿mite-proof. ﻿It ﻿is ﻿basically ﻿one-half ﻿percent ﻿(1/2%) ﻿permethrin ﻿and ﻿water. ﻿The ﻿other ﻿ingredients ﻿(if ﻿there ﻿are ﻿any) ﻿are ﻿a ﻿secret. ﻿Sawyer’s ﻿works ﻿great…lots ﻿more ﻿info ﻿on ﻿my ﻿page ﻿about ﻿mite-proofing ﻿clothes ﻿here. ﻿But ﻿you ﻿can ﻿also ﻿make ﻿your ﻿own ﻿1/2% ﻿permethrin ﻿spray. ﻿The ﻿concentrate ﻿you ﻿buy ﻿also ﻿has ﻿secret ﻿ingredients ﻿to ﻿make ﻿it ﻿adhere ﻿to ﻿cloth ﻿surfaces. ﻿You ﻿can ﻿put ﻿it ﻿in ﻿any ﻿kind ﻿of ﻿sprayer ﻿and ﻿simply ﻿wet ﻿down ﻿surfaces ﻿and ﻿let ﻿it ﻿dry. ﻿It's ﻿best ﻿to ﻿do ﻿this ﻿in ﻿the ﻿shade ﻿as ﻿sunlight ﻿degrades ﻿permethrin. ﻿A ﻿treatment ﻿by ﻿either ﻿Sawyer’s ﻿or ﻿your ﻿DIY ﻿mix ﻿should ﻿last ﻿6 ﻿weeks, ﻿even ﻿if ﻿you ﻿run ﻿things ﻿through ﻿the ﻿washer. ﻿I’ve ﻿had ﻿clothing ﻿I ﻿only ﻿use ﻿occasionally ﻿stay ﻿tick ﻿and ﻿mite ﻿proofed ﻿for ﻿years. ﻿You ﻿can ﻿use ﻿Happy ﻿Jack ﻿Kennel ﻿Dip ﻿II ﻿or ﻿Martin’s ﻿10% ﻿Permethrin ﻿and ﻿water ﻿to ﻿mix ﻿up ﻿a ﻿1/2 ﻿percent ﻿permethrin ﻿solution. ﻿If ﻿you ﻿decide ﻿to ﻿use ﻿the ﻿36.8% ﻿permethrin ﻿just ﻿be ﻿sure ﻿to ﻿let ﻿the ﻿petroleum ﻿distillates ﻿evaporate ﻿completely.…you ﻿should ﻿be ﻿able ﻿to ﻿smell ﻿when ﻿the ﻿mineral ﻿spirits ﻿odor ﻿is ﻿gone. ﻿To ﻿make ﻿1 ﻿gallon ﻿(or ﻿4 ﻿liters) ﻿of ﻿approximately ﻿.5% ﻿solution ﻿(1/2% ﻿solution).